By	Allyson Haymaker. Last edited by Marios Alexandrou on February 10, 2019. Millbrook Village in the beautiful Delaware Water Gap National Recreation Area faded away in the 1920s. But it's still a quiet place to explore, with houses and buildings dating to the mid-1700s. Split-rail and white picket fences neatly frame the buildings, and ancient lilac bushes and flowers surround some homes. Volunteers perform repairs the old-fashioned way, by hand and with vintage tools, and they demonstrate crafts on weekends from spring through fall. The village is busiest during Millbrook Days, the first weekend of October. 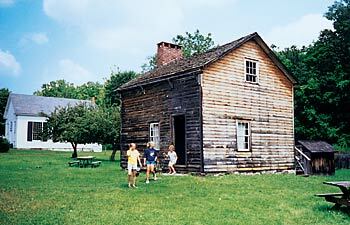 Artisans and craftspeople run the blacksmith shop, make cider and apple butter, hand-dye wool and weave on the old loom. Hams cure in the smokehouse, and treats cook on wood-burning stoves. While I enjoy Millbrook Days, I prefer to visit when it's quieter. As I sit on a bench on the General Store porch, listening to the nearby creek rush by, it's easy to imagine living here during a simpler time. Millbrook is in New Jersey's Northwest Skylands. From I-80, take the Flatbrookville exit–the last exit before you cross the toll bridge into Pennsylvania–and drive 12 miles north to Millbrook. You'll be on Old Mine Road, which is unmarked, in Worthington State Forest. The village is open Friday, Saturday and Sunday from Memorial Day weekend through mid-October. To learn more, phone 1-908-841-9531.